A Murderous Theatre of Blood was the late night attraction at the Surgeons Hall at the Edinburgh Festival 2012. 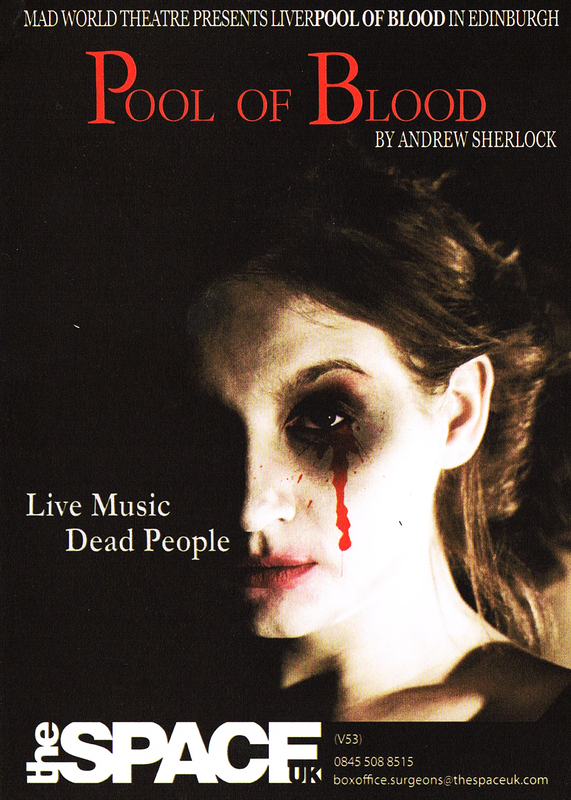 Live music and Dead people. Music Hall is dying in Liverpool 1911. Outside rioters take to the streets as an over-reached Empire spirals towards a war to end all wars. Inside, the latest French fad, Grand Guignol, a graphic Theatre of Blood, attempts to assuage a craving port’s audience. But will those dancing on the edge of the abyss be satisfied with the illusion of death? The murderous cabaret of no return sings its swan songs, while backstage washed bodies are readied for shipping. It’s anyone’s guess what to believe, as these intrigues of bloodlust unfold in a strangely familiar story. “If you want a mix of gore and laughs, this is the show to see. It’s a very British tale of dark forces and dark deeds intertwined with music hall and a few good giggles. The musical numbers were performed beautifully, the harmonies were all spot on, and the gore was also really realistic. Without giving too much away, decapitating somebody live on stage is a pretty impressive feat. All of the acting was brilliant, and the band were excellent at keeping the whole atmosphere of the piece constant throughout, some members even jumping up to be extra characters. The variety of accents was wide but accurate, and Claire Bryan’s portrayal of Desiree was beautifully executed and had me hanging off her every word. “This musical black comedy tells the story of a turn of an early 20th century music hall where the manager runs a secret trade in body-snatching. Little known is that everyone in the company has their own agenda and an axe or two to grind, and the wealthy financier has his own dark and strange designs on the place. It’s always a relief to see a performance that aims high and yet still remembers not to take itself too seriously. Mad World Theatre has transformed the main stage of Surgeon’s Hall into a whirligig of fun where the music comes thick and fast and there are moments of great slapstick humour as well as puns that vary from the sublime to the downright terrible.